MNy Arkitekter completed a handsome Finnish lake house that puts a contemporary twist on the traditional gabled timber home. Located on the shores of a small lake in Tenala, House Åkerudden celebrates wood by incorporating seven different varieties of locally sourced timber. 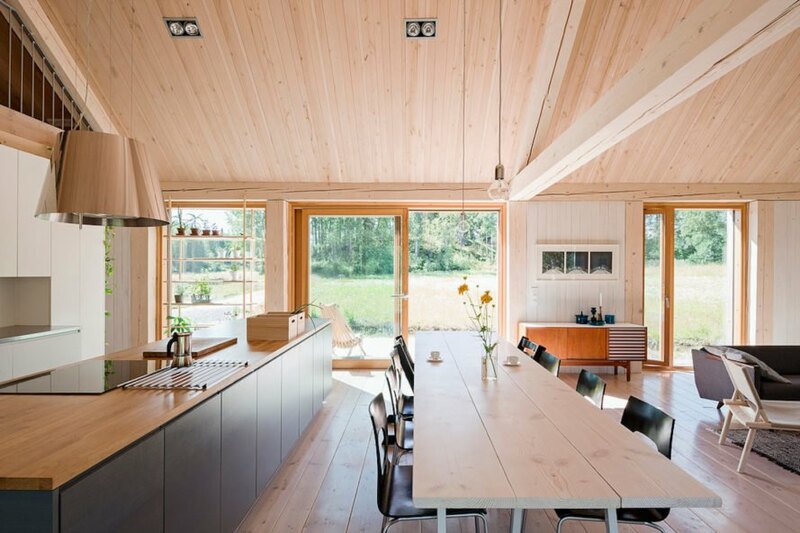 The warm and welcoming House Åkerudden owes its cozy character to its timber-lined and light-filled interior. Its gabled form is a reference to the local vernacular of Tenala, a rural community 60 miles west of Helsinki. Unlike the neighboring architecture, however, the lake house combines treated and untreated timber for a highly textured appearance that complements the surrounding field landscape. The house is clad in vertical strips of aspen and sits atop oak batons, while the outdoor decks are built with locally sourced Oregon pine. “The building’s idiom is simple and oblong and it settles naturally into the open field landscape,” said studio founder Mathias Nyström, according to Dezeen. “In its simplicity and apparent modesty, it approaches vernacular architecture without mimicking it. The goals were authenticity, simplicity, locality and sustainability.” House Åkerudden was built with a locally sourced spruce frame, which is kept exposed and was lightly treated with white-tinted oil. Oiled and untreated black alder paneling, as well as oak veneer, pine, and larch surfaces line the interior. Black-painted oriented strand board clads the staircase. Natural light streams in through large windows on all sides of the home that frame views of the outdoors. The home, aided by the double-height space in the large open-plan lounge and kitchen that occupy one half of the building, help make the home feel airy and spacious. The other half of the home comprises the bedrooms, bathrooms, and study, and is separated from the communal areas by an entrance hall. 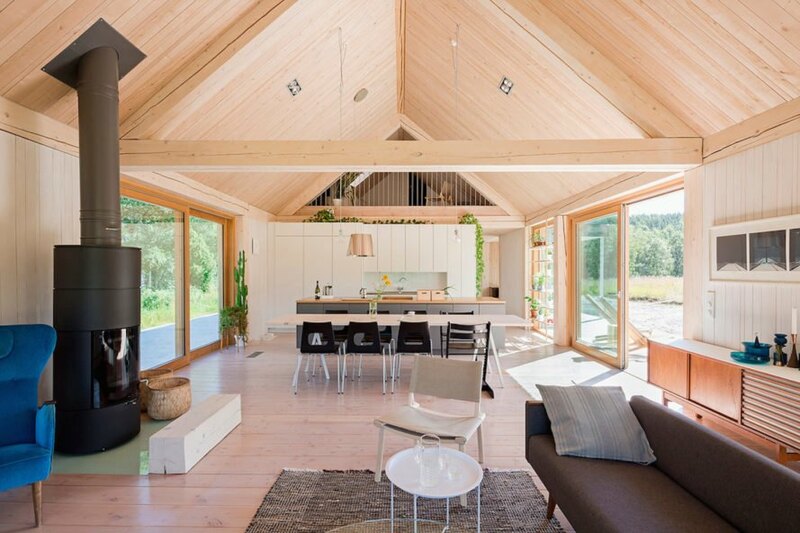 The warm and welcoming House Åkerudden owes its cozy character to its timber-lined and light-filled interior. 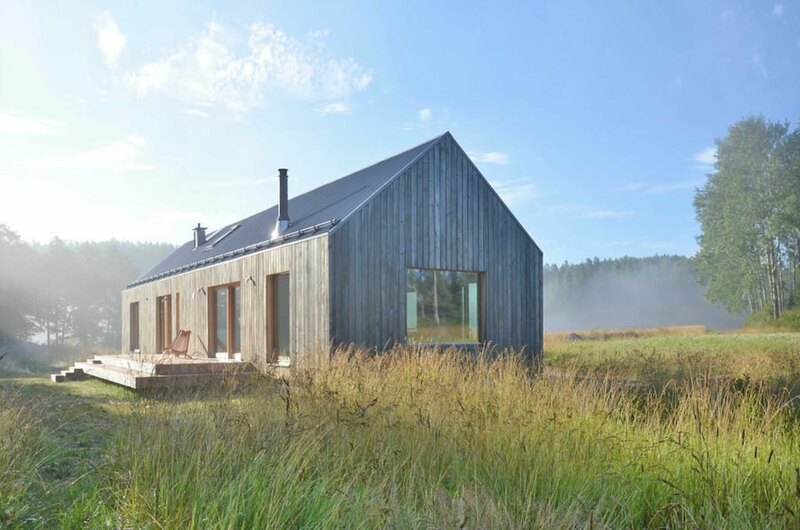 Its gabled form is a reference to the local vernacular of Tenala, a rural community 60 miles west of Helsinki. Unlike the neighboring architecture, however, the lake house combines treated and untreated timber for a highly textured appearance that complements the surrounding field landscape. The house is clad in vertical strips of aspen and sits atop oak batons, while the outdoor decks are built with locally sourced Oregon pine. House Åkerudden was built with a locally sourced spruce frame, which is kept exposed and was lightly treated with white-tinted oil. Oiled and untreated black alder paneling, as well as oak veneer, pine, and larch surfaces line the interior. Natural light streams in through large windows on all sides of the home that frame views of the outdoors. The home, aided by the double-height space in the large open-plan lounge and kitchen that occupy one half of the building, help make the home feel airy and spacious. The other half of the home comprises the bedrooms, bathrooms, and study, and is separated from the communal areas by an entrance hall.